The first and most obvious thing is they look like they have ten petals. But when you look closely you see it’s actually five deeply-cleft petals, one of the surefire ways of identifying these little guys, and they are little….and everywhere. 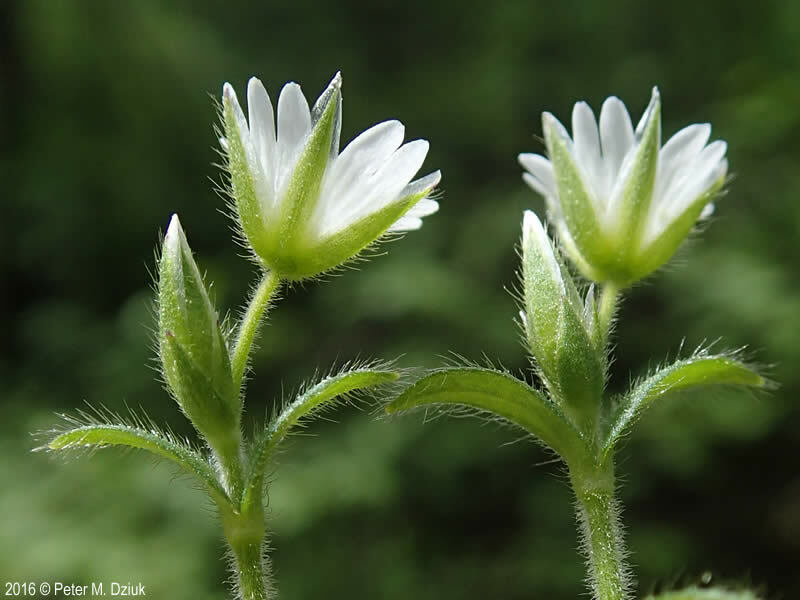 In the woods you are never alone for somewhere within 10 feet of you you can be assured a chickweed is sitting quietly. Pick an image for a larger view. See the glossary for icon descriptions. Early flowers are held tightly in the upper leaf axils but open into loose branching clusters with age, on ½ inch hairy stalks. Each flower is about ¼ inch across with 5 deeply notched white petals, usually 10 stamens with light yellow to greenish or even reddish blue tips (anthers) and a round green ovary in the center with 5 filament-like styles at the top. Leaves are opposite, toothless, stalkless, and somewhat variable in shape, the lower ones spatula to egg-shaped, 1/3 to 1 inch long and ¼ to ½ inch wide, the upper leaves becoming more lance-elliptic to oblong. Stems may be erect but typically sprawl along the ground, rooting at the nodes, with short sterile branches crowded around the base, the longer flowering branches barely ascending towards the tip. 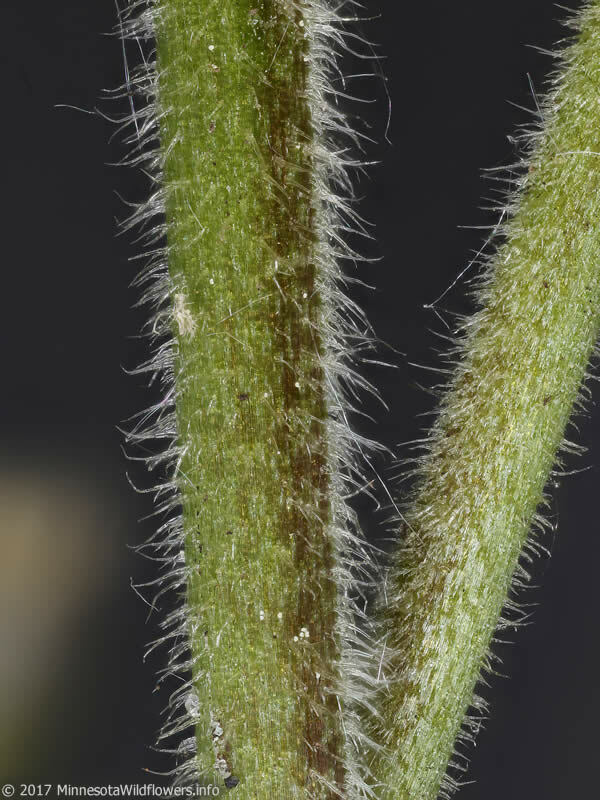 Both stems and leaves are covered with fine, spreading, non-glandular hairs. Fruit is a slightly curved, narrowly cylindric capsule, 1/3 to 2/3 inch long, about twice as long as the sepals at maturity, with 10 teeth around the tip. Inside are reddish-brown seeds up to 1.2 mm long. 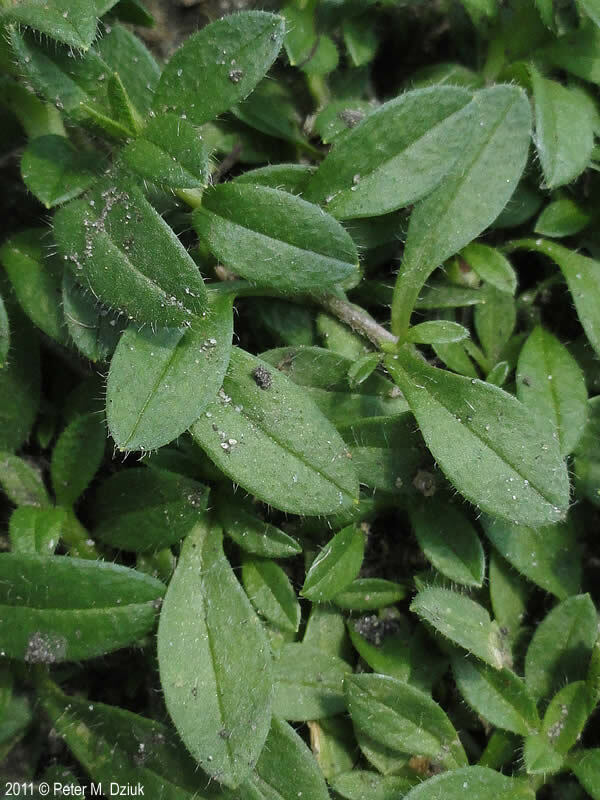 This is the “other” mat-forming chickweed and companion to Common Chickweed (Stellaria media), of lawn weed infamy; both are now widespread throughout North America. 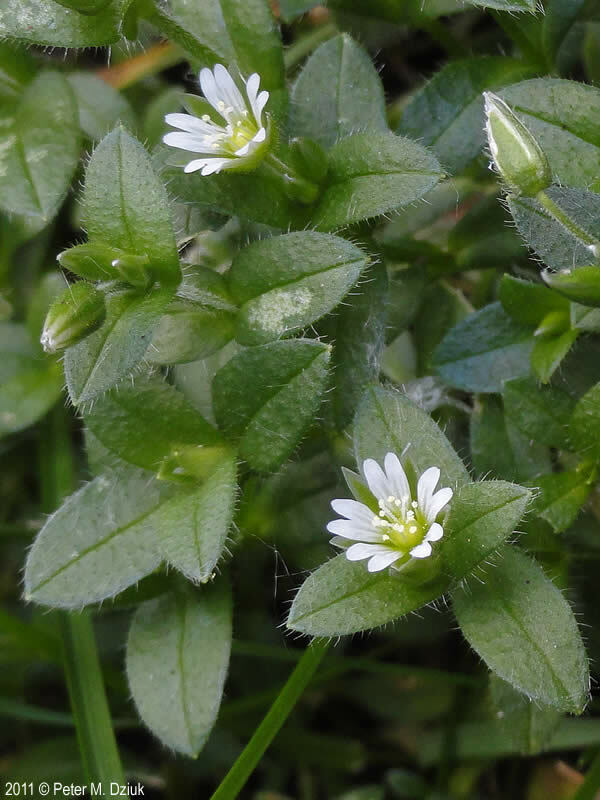 While the flowers are similar, Mouse-ear Chickweed is easily distinguished by its fuzzy leaves and stems, where Common Chickweed has hairless leaves and a single row of hairs along the stems. 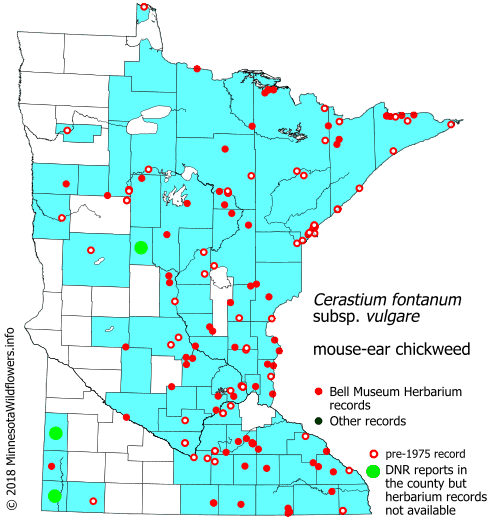 There are 2 subspecies of C. fontanum in North America: subsp. fontanum, only known from Greenland, has petals longer than sepals, seeds .9 to 1.2 mm long and never has glandular hairs in the flower clusters; subsp. 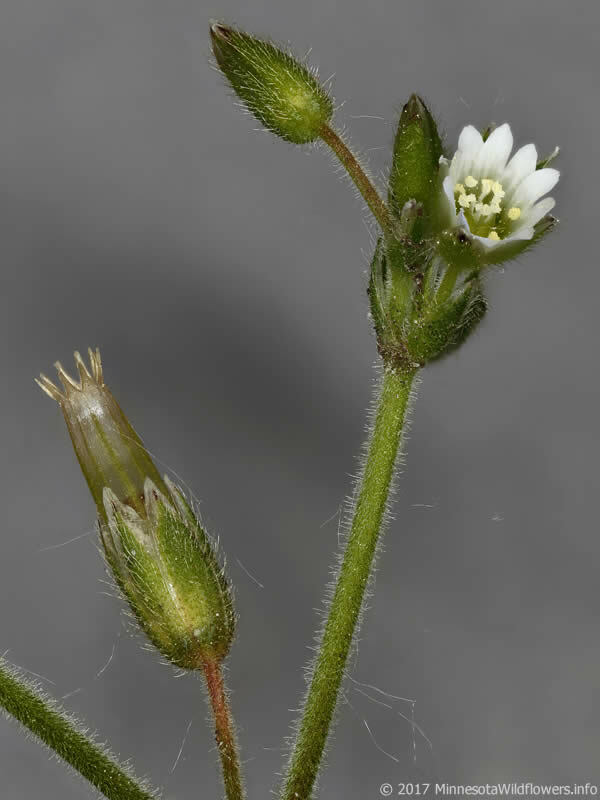 vulgare, found elsewhere in the range and sometimes known as Cerastium vulgatum, is occasionally (or rarely) glandular-hairy, has sepals about as long as the petals, and seeds .4 to .9 mm long. Previous Previous post: Look, Mabel, there’s a green tree!